carrying case to ensure excellent portability. portability and allow a quick and frequent assembly. unit that was designed for in-store sampling, tasting or demonstrations. durable plastic that is perfect for portability and long longevity. messages on two interchangeable inserts of 24” x 36”. Our line of pop-up counters is the lightest displays aimed for product tasting, sampling and demonstration. 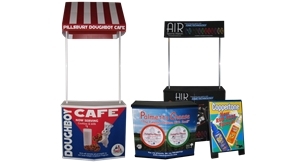 We specialize in lightweight and portable displays that can be simply carried from place to place and can assemble in minutes. These are crucial factors in an experiential marketing field that we build on. The majority of our portable counters are constructed from highly durable materials like aluminum, metal, high-density polyethylene plastic or core-plast to maintain tensile strength required for repeat usage. Our products come with a 1-year warranty, and we guaranty 100% customer satisfaction. Our promo booths with a “snap-in” system are designed to guarantee fast and easy assembly, with no tools required, and easy to carry. We also make sure that our display stands are lightweight and transportable to ensure excellent portability. You will enjoy the quality, simplicity and portability of our products.